Bhubaneswar: Bengaluru FC head coach Albert Roca believes his club has been the most consistent team in Indian football this season. According to East Bengal midfielder Mahmoud Al Amna, Bengaluru FC are the best team in India. In Miku, Sunil Chhetri and Udanta Singh, Bengaluru have the deadliest attack up front. All things considered, Bengaluru, for the second time this season, start favourites in a final of a tournament. But the word 'favourites' is just for writing's sake. Chennaiyin overcame Bengaluru in the final of the Indian Super League (ISL) earlier this month and there’s no reason why East Bengal can’t do the same on Friday in the battle for the Super Cup at city's Kalinga Stadium. Benglauru FC will look to end domestic season with a trophy and overcome the disappointment of ISL, while East Bengal would be hoping to prove that they are still a force to reckon with in Indian football. Both teams did not have it easy in the semi-final. East Bengal were up against formidable FC Goa and Dudu’s lone goal proved to be the difference. Bengaluru were down by a goal against Mohun Bagan and then lost Nishu Kumar to a red card, but came back strongly thanks to Miku’s hat-trick, eventually winning 4-2. In fact, both teams' performances in the tournament have followed a set pattern. Bengaluru turned matches around with terrific second-half games. East Bengal, on the other hand, conceded only one goal so far in the tournament. If East Bengal’s defence continue their top form, the onus to attack Bengaluru would rest on Katsumi Yusa, Al Amna and Dudu Omagbemi. The Yusa-Al Amna midfield combination has been vital for the team this season. Syria’s Al Amna is counted among the best foreigners playing in India. His ability to put a perfect ball to the striker and his bursting runs in the centre of the midfield have often paid rich dividends for his team. On the other hand, coach Khalid Jamil would hope that Yusa will bring the best of his creativeness on to the field against Bengaluru. Meanwhile, there’s a problem with East Bengal’s forward Dudu. He suffered an injury in the semi-final and he’s not certain to start in the final. 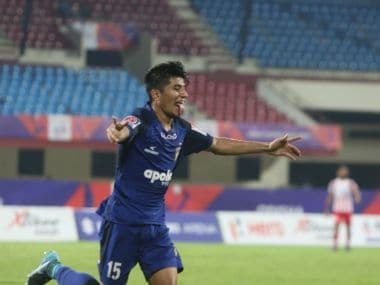 Dudu may not be as prolific as compared to say Miku or FC Goa’s Corominas, but on quite a few occasions this season, he scored important goals for his team. In Dudu’s absence, Ansumana Kromah will get a likely start. East Bengal’s defensive midfielder Khalid Aucho doesn’t get much limelight but his performances in the tournament have been top notch. Bengaluru’s passing game is strong, therefore Aucho’s interceptions and tackling will be valuable for his team. Albert Roca has a thing or two to prove against East Bengal. So far in his stint in India, he has never beaten the Kolkata side, failing in two attempts. His team’s biggest strength is the attack and Roca would like to play the same way Bengaluru played throughout the season. Be it ISL or Super Cup, Sunil Chettri and Miku have not stopped scoring. While India skipper Chhetri hardly ever disappoints, Miku has been the signing of the season for Bengaluru. In the semi-final against Mohun Bagan, Bengaluru were facing the prospect of an abject defeat. Just when things looked impossible for Bengaluru, Miku staged a miraculous comeback, scoring a terrific hat-trick and clinching the game for his team. Apart from Miku and Chhetri, the likes of Udanta and Toni Dovale have also given impressive performances for Bengaluru. The introduction of Dovale in the second-half against Bagan was a masterstroke by Roca as the midfielder provided the much-needed spark. A concern for Roca in the final is the fitness of centre-back Juanan as he remains a doubtful starter. Since Nishu Kumar will be missing the final due to red card, Roca will, most likely, play with three players at the back — Subhasish Bose, Erik Paartalu and John Johnson. "Juanan's getting better, but he's not 100 percent yet. We'll see if one more day is enough for him to play tomorrow (Friday). It's important that he's fit because he's one of our best defenders this campaign," Roca said in the pre-match press conference. With both teams favouring the possession-based football, the final is expected to be a high-intensity attacking game. East Bengal managed to keep FC Goa’s highly-rated attackers in check during the semi-final, something that will certainly boost their confidence going into the final. Bengaluru are coming into the title match after scripting a remarkable turnaround against Mohun Bagan. They have proven goal-scorers in their ranks who have the experience of playing big matches. Winning the Super Cup is important for both teams. 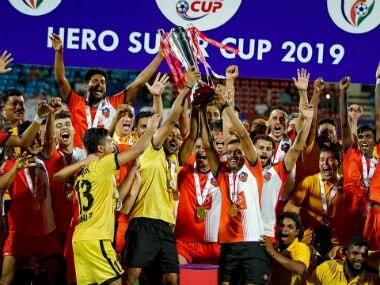 Bengaluru would like to keep their record of winning a trophy every year since their inception while East Bengal's last premium domestic title came in 2012 when they won the Federation Cup.